Persons born with Pluto in Aquarius may be erratic. They have original ideas, though they are biased by their unique experiences while growing up. They are usually nonconformist, so some may perceive them as strange or compulsive. They, however, know exactly what they are doing and why. They will use their unique angle on the world to gain more control for themselves. They feel their beliefs supersede everything else. They need to learn that their beliefs do not give them the right to steamroll over the rights of others. 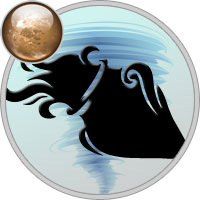 Aquarius Pluto is fascinated by the ideas of equality and liberty. They may be part of a movement that will result in drastic social change. From 1777 – 1799 and 2023 to 2043 Pluto is in Aquarius. Then we will finally see our technologies begin to change dramatically. New strides in the utilization of Clean Energy sources would be an expected outcome, and I believe that peace between nations may finally become a reality.